It is customary to call it the highest grade of felt,Which is beautifully covered and very pleasant in terms of tactile sensations. Its edges do not crumble, and therefore do not need additional processing. Therefore, when working with such material, the risk of getting a sloppy or spoiled product is minimized. 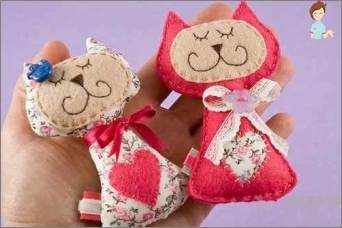 Felt has a very agreeable "Character»: It can be sewn together without the help of a professional sewing machine, and by using a conventional needle, there is no need to study and practice complex seams, but to decorate toys made by hand from felt. Simple, because it requires pieces of cloth and glue. Of felt with the same success can do notOnly elementary children's crafts, but also such serious things as: shoes, hats, accessories and household items. This material can be smooth and nap, the latter kind is represented by velor, short and long-woven cloth. Working with such a foundation is a pleasure, butThe technique of its manufacture is somewhat similar to the technology of paper production. Working with felt, there is no need to make allowances for seams, as the edges of the workpiece do not crumble, do not split and do not provoke the appearance of ugly "Tracks", Which is inherent in cotton and silk fabrics. It turns out that the simplest toys of felt can sew or glue even a small child who is able to manage with glue, scissors or make a few stitches "Forward with a needle". Options for the coloring of such materialThere is a great variety. And therefore, it will not be difficult to create really unique New Year's toys made of felt. 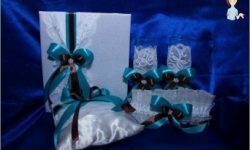 Moreover, the fabric for handicrafts can be done on its own, and not spent on its acquisition. First-class fluff or fine wool. The billet should be left to dry thoroughly, the edges should be leveled, and the excess water should be soaked with napkins. 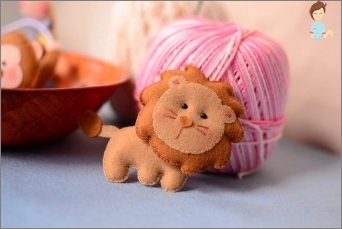 To sew toys of fur-tree or ordinary from self-made or industrial felt is not very difficult, because the edges of the material do not crumble, and they do not need to be bent. Due to this, isolated elements of the future craft can be combined with any seams, which in passing play the role of decorative design. Making educational toys out of felt, quite oftenIt is necessary to use the technique of applications. In this case, the adhesive should be carefully dosed so that it does not wet the substrate and does not penetrate it. If this still happened, the product can be saved only by pasting a duplicate pattern on the spoiled side. For appliqués on felt, not every glue is suitable. Often, the master uses conventional white PVA, which is bred as it is empty. Before sewing or gluing toys out of felt, the adhesive substance must be checked for suitability, that is, to make sure that it does not leave whitish spots and well holds the disparate parts. 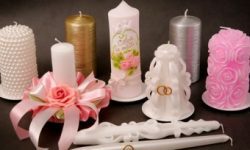 For fabric decorative elements suitableOnly two versions of PVA: universal and super, representing a viscous substance of yellowish color, in which there is not a single lump. When you want to make a felt article with your own hands, never get a stationery or wallpaper PVA. It is also undesirable to practice applying applications through "Moment"And all its possible counterparts. But, if there is no other way out, the glue should be applied with thin stripes and along the contour of the part. 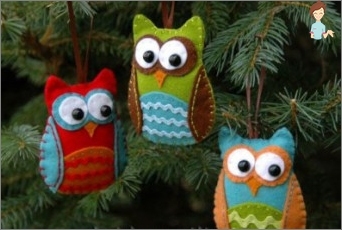 If you are going to make a Christmas treeAccessories for sale, be sure to spend on a quality glue gun, which will greatly facilitate the work with felt. In addition, it is worth buying a sewing machine, if you do not have the opportunity or desire to scribble. In order for a doll or other felt product to beNeat and durable, it should not be filled with batting, scraps of cloth or cotton wool. With their help it is impossible to evenly fill the workpiece, to avoid the appearance of bumps and depressions on its surface. Minus cotton wool is that it is unhygienic,It falls off during washing and dries very long, accumulating moisture and powder in itself. 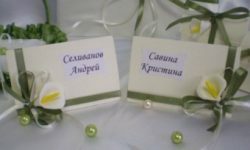 Concerning the unnecessary tissue scraps, we can say the following: if they are colored, they can completely shed on felt and spoil the appearance of the product. Given all this, we can say that the idealFillers for your future soft masterpiece - it's sintepon and camphor, granulate polyethylene and sintepon with holofayberom. Enjoy your handiwork and a lot of soft handsome!